He is currently LV64 He has been doing it for 81 hours. It is easier to grind in Final Mix due to sliding dash. It has not been done in about 12 years. He said in the original game the player had to constantly be aware with all of Tidus' movements AND there were no tech boost. Luckily, he has access to Tech Boost and sliding dash so it's pretty mindless. He chose night because it will require him about 5000 less experience to level toward the end. He is doing this just for fun and to prove it is possible. He is thinking about doing it with KH2 but probably won't. The grind will get faster once he gets his last tech boost. What do you tend to do during the Winter break? Looking to Recruit Some Vulpes! 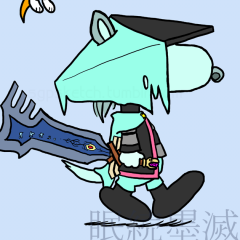 Union: Vulpes [NA] ID: 7609 Name of the Party: Dream ☆ Eaters Play Style: Core+ Latest Ranked: We just started this week so none at the moment. Available Spots: 28/30 Goal: We want to rack up a lot of lux and have fun with the game. Maybe possible break 100 or higher. Requirements: There's no lux requirement. We do expect each member to contribute one way or another. Either by having a decent pool to help others get by while they are progressing though the game. Or by just playing the game it's self to collect lux. This party can acepcct experienced players and beginners. But once you get a 6 star please share. I can help out a lot. We know that people have lives to live. So we can be pretty understanding just let us know whats going on some how. But over all, we want to have fun a build a community. :biggrin: My top 3 metals: *Vanitas: STR +915/DEF +485| SATK Boots on 4| Skill: Sleep (currently sharing) *KH II Cloud: STR + 1000/DEF +1000| SATK Boost on 2| Skill: Paralysis *Valor Form Sora: STR +970/ DEF +405| SATK Boost on 1| Skill: attack boost II max My Partners top 3 metals: *Zack : STR + 1000 / DEF + 1000 | SATK Boost on 3 | Skill: No Cost. *KH CoM Black Coat Riku: STR + 1000 / DEF +1000| SATK Boost on 5 | Skill: Poison *Peter Pan: STR + 1000 / DEF +1000| SATK Boost on 0 | Skill: Attack Boost All 1 Sharing: Auron: STR + 1000/ DEF +1000 | SATS Boost on 3| Skill: ATK boost II & Lux Plus Please Post or PM me if you are interested in joining! You can say any random quote you want(Disney and final fantasy alike). This can go on until you run out or can't remember any quotes. I'll start with "My friends are my power and I'm theirs." I know for sure that in December I will be getting Kingdom Hearts HD 2.5 ReMIX. Not entirely decided yet if I should get the limited edition or collector's edition. Anyways, if I do get the limited edition then I have a choice of getting one more game. So I just need help deciding which game would it be. Call of Duty: Advanced Warfare, Assassin's Creed Unity or Far Cry 4. Vote. All you've got to do is share urban legends, either they be native to your country, or just something that struck your attention the most. I'll start first. -------------------------------------- The tale begins with a young teenage girl, who was hired by a couple to babysit for an afternoon while they are off at a party with friends. The father greets her with a welcome smile, and takes her upstairs to meet the baby and the mother. The mother, who was very anxious about leaving her new child alone even for a little while, is introduced to the babysitter by her husband. The mother, still nervous, is reassured by her husband as they head downstairs to leave. The mother gives the young teen a list of do's and don'ts while they are out. The teen says everything will be alright. Once the couple leaves the house, the sitter can relax at last. She puts on some music, and sits down in a chair. The baby is asleep at the moment, so the sitter gets her purse and rummages through it. She makes herself even more comfortable when after going through her bag, and takes a small dose of LSD. An hour passes, and the couple are still at the party. The mother decides to check up on the babysitter, so she calls the house. Back at home, the phone rings and the sitter answers it, trying as best as she can to keep herself together as the drug has taken effect. The mom asks how everything is going. The sitter says everything is alright. She says she even put a turkey in the oven for dinner. The mother is immediately alarmed. "What turkey?" She asked. She is then cut off when the sitter abruptly hangs up the phone. The mom is struck with fear. More time passes and the sitter lets the drug take its toll on her mind. Time seems still, until the couple rush through the front door. They immediately ask about the baby. The mother runs upstairs to the nursery while the father asks the sitter what's going on. Then, he smells something in the kitchen. The mother runs to the crib and looks inside. The baby is nowhere to be found. The father runs into the kitchen, opens the oven, and and screams in horror by what he views. His child lies in the oven, roasted and lifeless. ----------------------------- Okay, your turn.